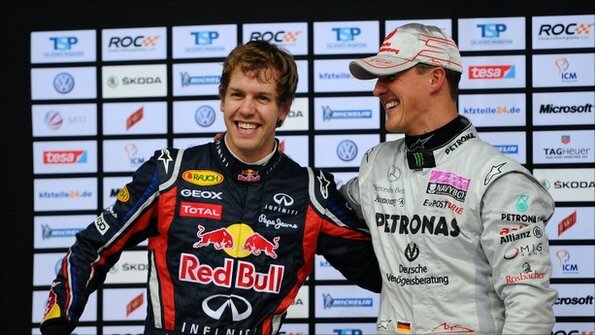 Red Bull won both the drivers’ and constructors’ championships for the second successive year in 2011. Here, design chief Adrian Newey and team principal Christian Horner talk to me about their plans for 2012 and praise the dedication, hunger and desire of Sebastian Vettel, who became the youngest ever double world champion. To some, the decision of Red Bull and Ferrari to pull out of the Formula 1 Teams’ Association, the umbrella group that represents the teams’ interests, could look innocuous enough. In reality it could have far-reaching consequences. The move by two of F1’s most powerful teams was provoked by continuing distrust about whether all of the competitors were adhering to the terms of a document called the Resource Restriction Agreement. The RRA sets out limits on the amount of staff, external spend and aerodynamic research teams can employ and covers work on the design of the car – with drivers’ salaries, marketing and engines excluded. It is not a budget cap per se, but it does have the effect of keeping costs under control, to the point that the biggest budgets have dropped from in the region of £300m in 2008 to an estimated £150-200m in 2011. To cite just one example, the RRA limits the amount of hours a team can dedicate to wind-tunnel testing – a key way of honing an F1 car’s aerodynamics, the single biggest performance differentiator. And the more wind-tunnel hours you do, the less simulation of aerodynamics on a computer is allowed (and vice versa). Because there is only so much of this work that a team can do, there is only so much money they can spend. The problem that has arisen is that some of the teams – led by Ferrari and Mercedes – believe Red Bull have been exceeding these limits since 2010, the first of their two consecutive title-winning years. Red Bull insist they have always operated within the RRA – and they counter their rivals’ accusations by pointing out that it is easier for an F1 team allied to a car company (as Ferrari, Mercedes and McLaren all are) to hide extra work than it is for one that operates in isolation. A year’s worth of talks to try to reach a compromise agreement with which everyone is happy have come to nothing, leading to a situation where Ferrari and Red Bull have run out of patience. They signalled their intention to quit Fota late on Friday – although they have to give two months’ notice. Ferrari’s statement was long and detailed, talking about their reluctance at a “difficult decision”, their ongoing commitment to cost-reduction and other changes in F1, and emphasising their own central role in Fota since it was set up in 2008. This in itself has led to more suspicion. It is clear, more than one insider has said, why Ferrari pulled out of Fota – if the organisation could not sort out an RRA, what was the point of it? – but Red Bull’s reasoning was very different. The implication being that the world champions did not like the RRA because they had no intention of adhering to it. Fota had become an inconvenience. Red Bull were not available for comment. This suspicion has been poisoning the atmosphere within F1 all year, despite attempts to reduce it. As well as the endless meetings aimed at bringing the two warring sides together, there was an investigation in the summer by external consultants into the way the teams were detailing their use of resources. But while Red Bull believe this effectively cleared them of wrongdoing, their accusers disagree. “The analysis showed more than one concern about what Red Bull were doing,” one insider told me. The next step, as laid out by the RRA, was for a full audit of the accounts of the team about which there were suspicions – if a certain number of teams wanted this to happen, the accused team had to agree. But this point was never reached, and after further meetings at the season-closing Brazilian Grand Prix, Ferrari and Red Bull ran out of patience. So what happens next? Is this the death knell for Fota? Will the departure of Ferrari and Red Bull lead to a domino effect of teams leaving the organisation? Alternatively, will a rump stick together, recognising that there can still be strength in numbers, not least in the forthcoming negotiations with F1 boss Bernie Ecclestone over a new Concorde Agreement, the document which binds the teams, the commercial rights holder and governing body the FIA together? That may become clearer after a Fota meeting on Tuesday. More importantly, does this mean the end for resource restrictions in F1 – and will the sport therefore revert to the ‘arms race’ spending that led to the RRA in the first place? On the face of it, the answer to that is no. The RRA is still technically in force. It is a legally binding document which lasts until at least 2012, or perhaps even 2017 – depending on whom you believe, and which version of the document you are talking about. In theory, if Red Bull’s rivals feel that they are breaking the RRA, they can sue them. If that sounds unlikely, one insider I spoke to for this article raised it as a possibility. Equally, though, Red Bull and Ferrari are due to meet the other members of F1’s big four – McLaren and Mercedes – next week to discuss resource restriction and how to move forward on it. That hardly sounds like the actions of a group of people on the verge of legal action. In public, everyone in F1 says they want to avoid a return to unrestricted spending. One of the main reasons for this is that (effectively) unrestricted money is no longer available to top F1 teams – the effects of the credit crunch have reached even this notoriously expensive sport’s rarefied climes. Many of the smaller teams are living hand-to-mouth to a degree, with only the top four existing in relative comfort. But even they have limitations on what they can spend. McLaren are a private team who have to live within the budget they can raise from sponsorship and other commercial partnerships. Mercedes, huge car company though it may be, has set clear limits on the amount of money its team can spend. Even Ferrari, who 10 years ago could effectively spend what they wanted, now have to be careful with money. But Red Bull are different, or so their rivals believe. Team principal Christian Horner insists they have far from the biggest budget in F1 – he ranks them about third or fourth. But his rivals raise their eyebrows at that, pointing out that Red Bull is worth billions and that the soft-drinks company is weathering the global economic downturn well by comparison with car companies and traditional corporate giants. In that sense, their rivals say, they really can spend what they want. So whether founded on reality or not, and whether the accusation at its heart contains any truth, the fear at the heart of F1 is quite simple. If Red Bull, despite the RRA, are prepared to spend what they want, as well as having the best designer in Adrian Newey and arguably the best driver in Sebastian Vettel, who can stop them dominating for years to come?